Editor’s Note: We continue our “Conversion Tip” series with Charles Nicholls, founder and chief strategy officer of SeeWhy.com, a conversion and cart-abandonment recovery firm. For this installment, Nicholls addresses the implications of consumers entering invalid coupon codes. Some consumers refuse to buy unless they get a “special deal.” A friend of mine (who ironically also runs an ecommerce site) refuses to buy as a matter of principle unless he can find a valid coupon code. “As soon as I see the coupon code box, it’s like a challenge to get a better deal,” he says. When visitors enter invalid coupon codes, this is very strong precursor to abandonment. A few may have typed the codes incorrectly. But for the majority, it is a signal that they are looking for a better deal. At this point, they probably have another tab open on a coupon code or price comparison site, and they may try multiple codes before abandoning. In practical terms your options are limited here if you want to save the sale. Either provide a page with valid coupon codes, or, alternatively, send the consumer an email with a valid coupon code. If you have already created a page with valid coupon codes, then the email can simply direct them to this page. 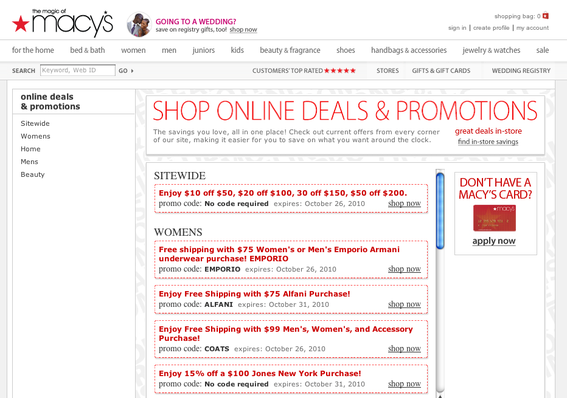 Macy’s lists valid coupon codes on its website. 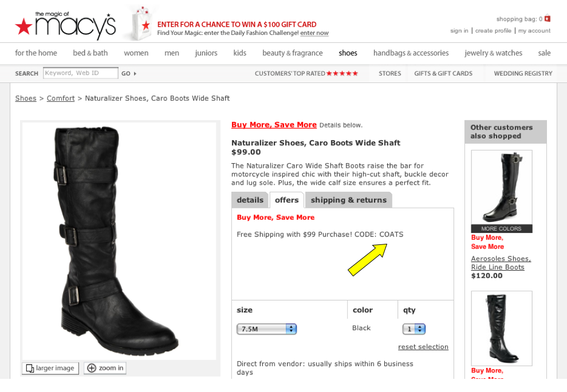 Macy’s also shows coupon codes directly on the applicable product pages, in the “Offers” tab.